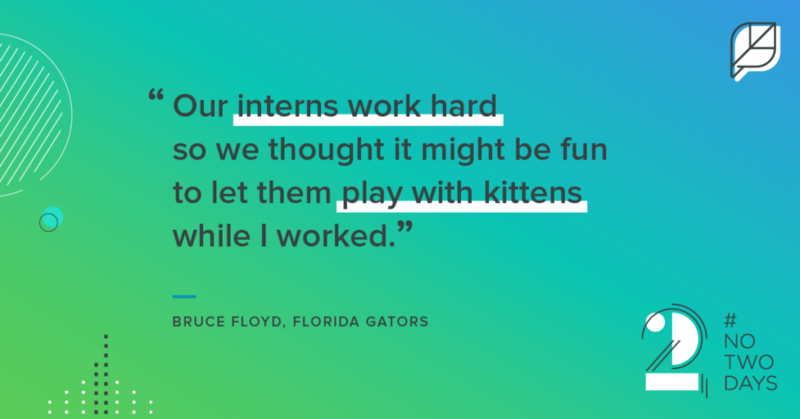 In the second installment of our new series, #NoTwoDays, we examine the day of fellow marketer Bruce Floyd, social media manager of the Florida Gators, to discover how he adapts to change, incorporates routine and balances his workload. 8:16 a.m.: Sleep disturbed by the Sencha tone coming from my iPhone alarm. I’m not ready and hit snooze. 8:34 a.m.: Ok. Fine. I’ll get up. 8:45 a.m.: After cleaning up, I plop down at my home office desk and get caught up on email. I review tweets and Facebook posts from official Gators accounts to see if any can be shared through the main Florida Gators accounts; sourcing content from our other accounts not only makes my job a little easier, it really helps boost our engagement and drive traffic. 9:30 a.m.: Time to head into work. I drive the most rugged of scooters, a Honda Ruckus, for convenience. Parking on campus can be a hassle, but the scooter parking is literally right next to the entrance of my office, so my commute time is really short – around 8 minutes. 9:38 a.m.: Parked and walking up the stairs to my office! 9:39 a.m.: The Keurig beacons! The office coffee maker we all use is also used by Coach Steve Spurrier – it has been touched by greatness! 9:44 a.m.: The University Athletic Association offices are located in Ben Hill Griffin Stadium, so I’m one door away from this view. Not a bad way to spend lunch! 9:45 a.m.: I just reviewed recent posts from our official Facebook Pages to check performance; this helps suggest which posts on those sports accounts might be worth sharing on our main account. 10:12 a.m.: Kitten time (yes, I’m serious)! My girlfriend and I foster kittens for Gainesville Pet Rescue and she was in the area running errands and dropped a few off. Our interns work hard so we thought it might be fun to let them play with kittens while I worked. I put one of my new 360-degree cameras in with them to test live 360-degree streaming on Periscope. 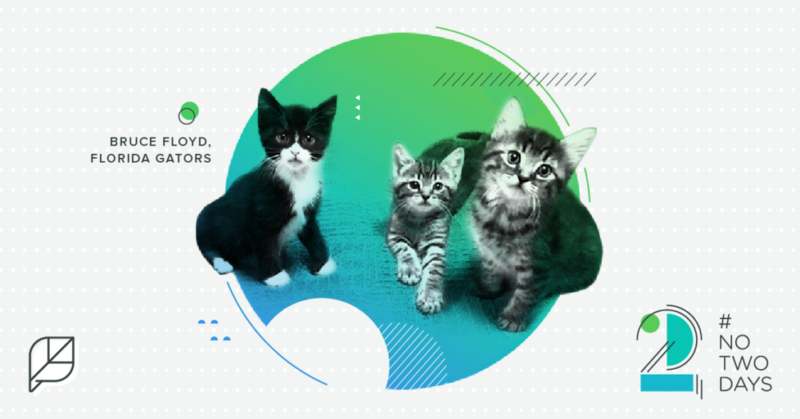 10:30 a.m.: While the team was enjoying the kittens, I went over our NFL Draft social media plan, since tonight is is the first day of the draft. We expect at least one of our Gators to be picked in the first round, so I want to make sure I’m ready with a plan that integrates with Gators Football, Coach McElwain and our school’s main social media accounts. 11:30 a.m.: Time for the kittens to leave. My girlfriend swung by and took the kittens back home. Bye, kitties! 11:47 a.m.: After identifying a list of what our newest Facebook videos will be, I assign an intern to add captioning to them using Facebook’s auto-captioning functionality. Since a large percentage of viewers watch videos on Facebook with the sound off, adding captions helps with video retention and ensures the videos are more accessible. 12:00-ish p.m.: Ate some homemade chili mac with ground turkey. Comfort food FTW. 12:30 p.m.: My supervisor stopped by and we ended up discussing Facebook. We talked about how I’ve maintained steady, organic reach-per-post on the network while others have experienced a precipitous decline. 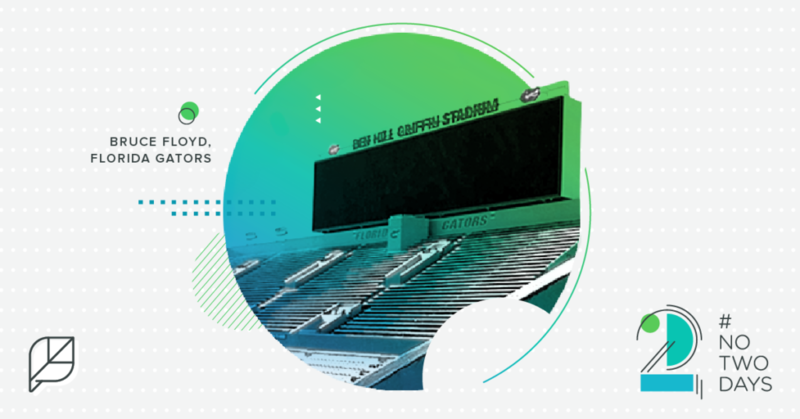 My strategy has been to review each video as it is posted to our Facebook sports accounts, such as Florida Gators Football, and see how well those audiences are responding to them. If there is good engagement at the onset, it’s an obvious indication of success so I post it to our account. We also try to optimize everything we post. For instance, in the case of videos, we’ve had success converting them to a square format. We’ve also been more diligent about adding captions, because many people watch videos on their timeline with the sound off. 1:25 p.m.: My calendar just informed me that I have five minutes to get to our large multi-purpose conference room for a workshop on running effective meetings–I hustle downstairs. This should be both informative and revealing. 2:30 p.m.: Came to the realization that my meetings are terrible. I have a meeting every Wednesday with select people from different areas of the University Athletic Association to discuss social media trends and upcoming marketing initiatives; I definitely need to retool it based on what I’m learning in this workshop. 4:00 p.m.: Finished with my workshop and back in my office. First thing, I check the status of our posts on Facebook. I try to reinforce good behavior, so if I see a good and/or positive comment on our posts, I give them a 👍 . I also look at our inventory and plan out posts for the rest of the day. 4:07 p.m.: I’m doing some live 360-degree video tests with a new 4K camera I recently received. I decide to go through several different live-streaming tests of resolution and bitrate to see what the maximum settings are for each platform: Facebook Live, Periscope, and YouTube. 6:10 p.m.: At home I drop my stuff off in my home office (also known as @FloridaGators after-hours HQ). 6:45 p.m.: Dinnertime with my girlfriend and our two cats. Family time! 8:00 p.m.: The NFL Draft has begun and I’m keeping one eye on the broadcast feed and the other on some After Effects tutorials. In my job, it’s important to have some knowledge about video and photo editing and basic layout design. I’m trying to include some After Effects training so I can add additional flair to the edits I create. 10:46 p.m.: Jarrad Davis is picked 21st by the Detroit Lions! (Well deserved, I might add. He’s a great Gator!) I follow the plan we created with pre-designed video assets shared to Twitter, Facebook and Instagram, followed by additional ones from Coach McElwain’s accounts, and support shares from the main accounts. So what do you think of Bruce’s day? Questions? Comments? Keep the conversation going by using the hashtag #NoTwoDays and share your story!